Being active seems to come so naturally with warm temperatures, doesn’t it? 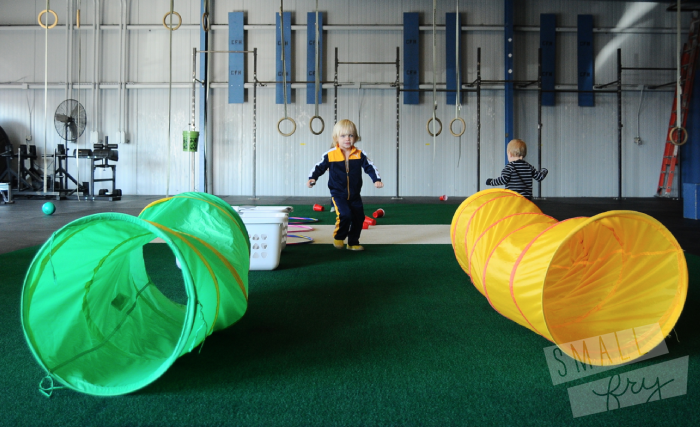 This winter we’ve brainstormed ideas for a little indoor exertion! We’ve quickly found as mothers of boys that all you need are four walls, a few balls, and a little room to be destructive. If you have a garage, church gym, or in our special case a Crossfit Hyperion, you have a day of fun ahead! We focused on using household items for our obstacle course, to ensure an easy time replicating it at home. You’re going to want to try this with your little ones, it was an absolute blast! Tunnels, hopping through hula hoops, running patterns through plastic cups (or just kicking them over seemed to be the most popular option.) Shooting (laundry) baskets and running at top speeds were all huge hits for even the tiniest Small Fries. Thanks Hyperion for having us!